As our resistance war and national construction were riddled with ordeals 70 years ago, on the 11th of June, 1948, President Ho Chi Minh made an appeal for patriotic emulation in the spirit of “all-people resistance war, all-out resistance war….resistance war in tandem with national construction”. This marked a significant milestone in the course of the Vietnamese revolution and reflected our beloved Uncle Ho’s strategic thinking and vision and creativity in order to rekindle traditions of patriotism, diligence, courage and creativity among people of all strata towards the ultimate victory of the revolution. Since then, President Ho Chi Minh’s appeal for patriotic emulation has served as an invaluable asset to contribute to generating great political and spiritual vigour to bring consecutive victories to the Vietnamese revolution. 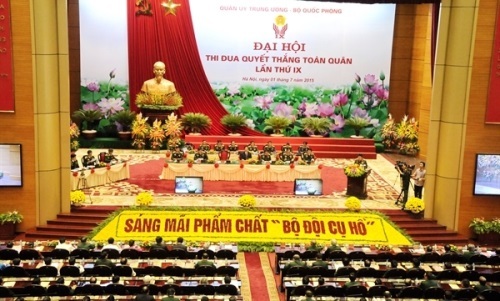 For over the past 70 years, being imbued with President Ho Chi Minh’s thought on patriotic emulation and in response to the nationwide patriotic emulation movement, the “Determination to win” emulation movement across the Vietnam People’s Army (VPA) has increasingly gathered momentum to achieve great effectiveness. With such emulation movements as “Killing the enemy as a brilliant feat” during the anti-French resistance war, “Determination to defeat the American aggressors” during the anti-American resistance war, and “Determination to win” during the period of national construction and protection, there have emerged tens of thousands of role models and heroic collectives embodying the iron will and dogged resolve of the people’s armed forces in particular and the entire nation in general in the struggle for national liberation and in the period of Homeland building and safeguarding. Since the introduction of Doi Moi 30-plus years ago, in the furtherance of Uncle Ho’s thought on patriotic emulation, the whole VPA has thoroughly grasped resolutions and directives by the Party, the Central Military Commission (CMC) and the Ministry of National Defense (MoD) on emulation and reward, the centrepiece of which include Directive 39-CT/TW, dated May 21st, 2004 and Directive 34-CT/TW, dated April 7th, 2014 by the Politburo (11th and 12th terms); Directive 339-CT/ĐUQSTW and Directive 507-CT/QUTW dated July 28th, 2014 by the CMC’s Standing Committee. This has brought about profound transformations in awareness and responsibility among cadres and soldiers throughout the VPA pertaining to the patriotic emulation movement in general and the “Determination to win” emulation movement in particular. Innovations have been seen in leadership, direction and implementation when it comes to the emulation-reward work. The VPA’s “Determination to win” emulation movement has been launched with alacrity and gained multifaceted strength. Revolutionary ardour has been built up to encourage collectives and individuals to defy all the odds and successfully fulfil their assigned tasks thanks to emulation movements and massive campaigns throughout the VPA, including “Making units comprehensively strong”, “Making Party organizations pure and strong”, “Adopting an exemplary lifestyle and maintaining discipline”, “Excellent training and high combat readiness”, “Military logistics industry following Uncle Ho’s teachings”, “Managing and using materiel effectively, durably, safely, thriftily and traffic safety”, “VPA joining hands in building new-style rural areas”, “Military Youth striving for their peaks”, “Excellent labourers” and “Creative labourers” within the military Trade Unions. - promoting internal strength, self-reliance and self-resilience to boost productivity, thereby contributing to socio-economic development, military build-up and Homeland protection. The VPA has thoroughly grasped the Party’s lines and guidelines and effectively fulfilled their function as an advisory body of the Party and the State concerning military-defense issues. They have proposed appropriate measures for dealing with incidents and sensitive issues so as to prevent the country from being caught off guard, to firmly protect independence, sovereignty, unity and territorial integrity, and to maintain a peaceful and stable environment in the interests of national construction and protection. At the same time, the VPA has brought into full play their core role in building all-people national defense and the all-people national defense posture associated with the people’s security posture, particularly “people’s hearts and minds” posture while promoting fine traditions of Uncle Ho’s soldiers. In doing so, the VPA has earned effusive praise and great trust from local authorities and the people. In the years to come, alongside predominant favorable conditions, our country is likely far from immune to challenges the socio-economic development, military build-up and Homeland building and safeguarding. Hostile forces will likely step up their sabotage activities in political, economic, ideological and cultural terms, employ the “peaceful evolution” strategy and promote “self-evolution” and “self-transformation” inside the VPA, depoliticization of the military and the removal of the leadership of the Communist Party of Vietnam over the military. Against this backdrop, it is essential that the entire Party, people and military should foster solidarity and unity and exert themselves on all fronts in the interests of military-defense tasks and Homeland protection in any circumstance. In response to the Resolution of the 12th Party National Congress, the Resolution of the VPA’s 10th Party Congress and Ho Chi Minh’s thought on patriotic emulation vis-à-vis the performance of military-defense tasks in the new situation, importance should be attached to the following. First, continuing to promote proactiveness and creativity in researching, assessing and predicting situations to properly advise the Party and State on military–defense issues, thereby effectively dealing with all possible contingencies. This is a matter of paramount importance in the interest of Homeland protection in the new situation. The whole VPA in general and their strategic agencies in particular should be proactive and sensitive to strategic research in order to assist the CMC, MoD in properly advising the Party and State on military –defense policy-making. Together with the implementation of the Resolution of the 11th Party Central Committee’s 8th plenum on the Strategy for Homeland protection in the new situation and the Resolution of the 12th Party National Congress on military-defense issues, the VPA should proactively counsel the Party and State to concretize and implement the Defense Strategy, the Military Strategy and the Strategy for Homeland protection in cyberspace. This task is of great importance both in the immediate and long terms that the VPA as the core force should strive to successfully fulfil. Nowadays, the world’s political and military milieu continues to be complicated and unpredictable characterized by the cut-throat strategic competition among major powers. Internalizing Uncle Ho’s thought on patriotic emulation into the situational research and assessment, the VPA’s advisory bodies at strategic level should keep track of the global, regional and domestic situations. Doing so will be conducive to closer cooperation among relevant agencies and units in proposing appropriate measures for dealing with defense, security and diplomatic incidents, thereby precluding the country from being caught off guard. At the same time, military commands and border guard commands at all levels should expand their roles in properly advising local authorities on military and defense tasks on the spot. Agencies and units throughout the VPA should keep a close watch on situations, particularly in strategic, border and island areas in order to update and finalize comprehensive plans for war fighting, disaster relief, search and rescue, etc., thereby increasing their capabilities to deal with incidents as soon as at grass-roots level. Second, strengthening the VPA’s core role in building the strong all-people national defense and the firm all-people national defense posture associated with the people’s security posture. Our Party and State has always put great store by building the strong all-people national defense as a central task assigned to the VPA to meet the requirements of Homeland construction and protection both in the immediate and long terms. Therefore, the internalization of the “Determination to win” emulation movement into this central task should be made regular, innovative and appropriate. To this end, main units and the border guard force should proactively build the all-people national defense via appropriate and effective measures in line with their specific circumstances. Military commands at all levels should proactively advise local authorities on this task while closely cooperating with relevant forces in strengthening the all-people national defense. Based on the review of the 10-year implementation of Resolution 28-NQ/TW, dated September 22nd, 2008 by the 10th Politburo on continuing to build centrally-run cities into firm defense zones, importance should be attached to the quality of those defense zones in the direction of “comprehensiveness but focalization”. Emphasis should be placed on building the all-people national defense posture associated with the people’s security posture with special attention being devoted to building the “people’s hearts and minds” posture, thereby facilitating the building of the all-people national defense across the country, particularly in strategic regions. Education about military and defense matters should be promoted in order to contribute to raising public awareness of the task of Homeland protection among people from all walks of life. The MoD’s functional agencies and military commands at all levels should proactively counsel and direct the building of the mobile militia, the maritime self-defense militia and the regular self-defense militia forces in strategic, border and island areas. There should be close cooperation with relevant ministries and local authorities in performing the State’s management in national defense. Military capabilities should be expanded, the distribution of which should be determined via a unified strategy, thereby generating aggregate strength in the interest of Homeland in the new situation. Third, adopting synchronous measures to contribute to developing the VPA’s combat readiness and combat power. Party Committees and commanders at all levels should implement various practical and effective measures to make the military politically strong. The ideological and political education should be renovated in terms of contents, forms and methods so that it stays close to reality and squares with the Project entitled “Renovating the ideological and political education in military units in the new period”, the Politburo’s Directive 05-CT/TW as well as the campaign “Promoting traditions and devoting talent to deserve to be Uncle Ho’s soldiers”. Emulation movements should be aimed at improving the quality and effectiveness of mass mobilization and policies regarding military families. The roles played by Steering Committee 94 and Force 47 at all levels should be strengthened while the “peaceful evolution” strategy and wrong viewpoints should be combated. At the same time, it is essential to identify and roll back manifestations of ideological, political, moral, lifestyle degradation, “self-evolution” and “self-transformation” inside the VPA. Doing so will enable cadres and soldiers to develop their revolutionary ardour, professional competence and sense of solidarity to defy all the odds and successfully fulfil their assigned tasks. Together with striving for breakthroughs in organizational structure and discipline maintenance as stipulated by the Resolution of VPA’s 10th Party Congress, Party committees and commanders at all levels should launch a lot of emulation movements to bring about profound transformations in the quality of training across the military with emphasis on making leadership, direction, organization and testing scientific and practical. Attention should be paid to specialized training with practice taking priority over theory. Importance should be attached to advanced materiel mastery, night combat training, troop movements and physical exercise. On the basis of results yielded from 2017 training and exercises, the continued quality should be enhanced regarding inter-service military exercises, confrontation exercises, live-fire drills and defensive area exercises. The Strategy for the VPA’s education and training in the 2011-2020 period should continue to be effectively implemented with emphasis on renovating contents and forms in line with cadres and soldiers’ knowledge levels to make sure “practice makes perfect”. At the same time, agencies and units should focus their leadership and direction on such fields as logistics, technology, finance, defense industry and military science research to meet the requirements set out by the new situation. Fourth, continuing to enhance the effectiveness of international integration and defense diplomacy. This is a matter of paramount importance to Homeland protection in its infancy and from afar in line with the Party’s line as evidenced by the history of our struggle for national construction and protection. Therefore, in addition to synchronous measures for the implementation of resolutions and directives by the Party, CMC and MoD on foreign affairs, Party committees and commanders at all levels should step up the emulation movement regarding international integration and defense diplomacy. Agencies and units should concretize the VPA’s “Determination to win” emulation movement into their specific targets to aim for in terms of international integration and defense diplomacy. It is essential that bilateral defense cooperation should be enhanced on a deep, substantive and balanced basis. The VPA should also actively participate in global and regional mechanisms for multilateral defense cooperation. In the immediate term, efforts should be focused on devising and finalizing the master plan for defense diplomacy activities in 2020 when Vietnam assumes ASEAN Chairmanship, on joint patrols and border defense friendship exchange programs with neighboring countries, on the deployment of the level-2 field hospital to join the United Nations peacekeeping mission in South Sudan and on the VPA’s enhanced status in the international arena. In the long term, political cooperation should be closely associated with military- technical and military trade cooperation while importance should be attached to training cadres specializing in defense diplomacy. In the meantime, consideration should be taken into as to the VPA’s possible participation in a number of multilateral exercises in humanitarian assistance, search and rescue, disaster relief, etc., in varying degrees in order to foster mutual trust and understanding and share experiences with other militaries. The 70th anniversary of President Ho Chi Minh’s appeal for patriotic emulation helps to enable us to be more fully aware of the importance attached to this event. As a result, the entire VPA should continue to study and emulate Ho Chi Minh’s ideology, morality and lifestyle and to promote the “Determination to win” emulation movement in order to heighten public awareness of and successfully fulfil military-defense tasks, thereby contributing to firmly protecting the socialist Vietnamese Homeland in the new situation.